In this era of Helicopter Parents and more government entitlements and “babysitting,” it’s no wonder our children aka young adults, are less and less able to take care of themselves. Pampered, spoiled, entitled, dependent, are some of the words that come to mind when I think about older teens and young people in college and recent graduates. Why is this the case? Like most social issues, it isn’t black or white, but a combination of factors, which I’ll try to illuminate from this dad’s point of view. Recently, one of my teen sons needed some help. Whether my help would qualify as a “rescue” or not is immaterial because I’m not going to tell that story. His privacy is to be respected. All is well and after the incident had passed, I began thinking about this whole societal issue and how today’s younger adults are dealing with the pressures of their lives in ways different from previous generations. I will declare – here and now – that I believe today’s younger generation has it harder than my own generation did. The economy is worse. College on every level is much worse, from getting into a good college to the quality of the education. 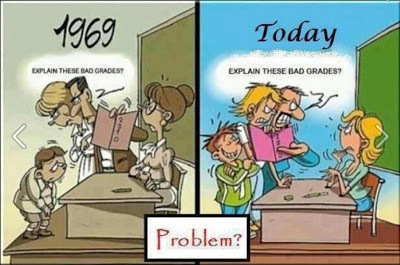 Primary education is close to a total disaster and the breakdown of the traditional family, especially in some groups, has been disastrous to our kids. This all adds up to a perfect storm of challenges that caring and involved parents face, from the extreme peer pressure exerted on all ages of kids via social media to the very real job and income issues everyone faces, but more so for THAT age group that is just getting started. The jobs I had as a teen no longer exist for teens today. When is the last time you saw a boy on a bike throwing newspapers? That was my first job at 12 or 13! When a new Trader Joe’s (a local popular market chain) announced a new store in our area, the number of job applications was off the charts and many of these entry-level jobs were being sought by adults that in the past would have been working at a higher paying desk job or blue collar job at a local factory. That work is now overseas, for the most part. The incredible irony is that now, when our younger generation most needs skills to be entrepreneurial and clever in their work and job choices, they are being taught to be dependent by much of our society. It is the exact opposite of what they need to survive in today’s world. I won’t throw blame other than disparaging the side of the political aisle that keeps on courting voters by giving them things. That is simply destructive. The decline in the economy, schools, and generally more difficult job environment is a result of many years of questionable practices and some circumstances – perhaps cycles – that occur as much as the weather patterns change. Our current state – economically and societal – has occurred without logic, often seemingly arbitrary, and sometimes precipitated by a very big man-made (war, 9/11) or natural disaster. That is simply life. Where we parents have contributed to the problem is a result, in my opinion, of the changing family structure and changing roles in many families. The rise of single parent households means there is less parental supervision – time – spent with the children. Dual working couples often face the same time conundrum. Sometimes, I believe couples choose to both work for materialistic reasons. Wanting new cars, a better home, great vacations, and the like can wait until the kids are grown. But, many couples are convinced they “need” to both work. There is the equality issue in many such couples that has to do with the evolution of the feminist movement and the disparagement of the stay-at-home-parent. I think this is less prevalent than a decade or two ago, but it does motivate many couples to each “need” to work for their own ego satisfaction and sense of worth. Consequently, kids are left more on their own, literally and figuratively. The things that assault them on a regular basis are quite pernicious and too many parents don’t put limits on their kid’s access to Social Media and all forms of entertainment. Who are the role models for our kids? You know the answer and it ain’t pretty. Is hard work a value being promoted in any area of our children’s lives? What do they learn at school and college besides politically correct values and rewritten history? God is banned from the public sphere, as are the values upon which our country was founded. This entry was posted in Weekly Columns and tagged #DadChat, A Dad's Point-of-View, aDadsPOV, Bruce Sallan, Dad Blog, dads, Helicopter parents, Life Lessons, Moms, Over-Protective Parenting, Parenting Tips, Social Media, Teaching Kids Independence by Bruce Sallan. Bookmark the permalink.